(APN) ATLANTA — On Monday, May 02, 2017, the City Council of Atlanta unanimously adopted a resolution that creates two clean energy goals for the City of Atlanta – one to power all electricity in City-owned buildings with clean energy by 2025, and another to power all electricity in the City with clean energy by 2035. The vote was fourteen to zero, with Councilman Ivory Lee Young (District 3) not voting. As a resolution, the legislation, 17-R-3510, expresses the policy vision of the City Council; however, it does not have the effect of mandate. Having a goal is still an important first step, the bill’s author, Councilman Kwanza Hall (District 2) said in a statement. “We have to set an ambitious goal or we’re never going to get there,” Hall said. The City of Atlanta has been slow to implement the use of solar panels on City-owned properties, even as there has been an uptick in solar use in recent years, as previously reported by Atlanta Progressive News. Setting this ambitious goal could help accelerate the City’s implementation of more solar panels over the coming years, especially as the price of solar technology has continued to dramatically decrease. 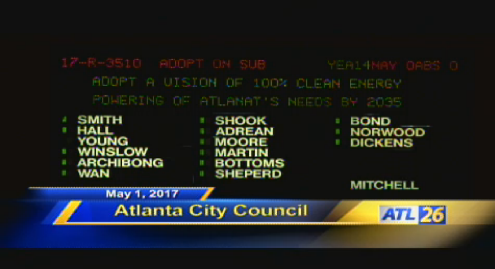 The resolution further calls upon the City’s Office of Sustainability to prepare a report by January 2018 regarding how the City of Atlanta can meet these goals; and the Office has agreed to do the analysis. “We know that moving to clean energy will create good jobs, clean up our air and water, and lower our residents’ utility bills,” Councilman Hall said. “We never thought we’d be away from landline phones or desktop computers, but today we carry our smartphones around and they’re more powerful than anything we used to have,” Hall said. Hall’s legislative aide Colleen Kiernan–formerly of the Georgia chapter of the Sierra Club–provided research and drafting. The move to introduce the resolution came conspicuously after Hall, who is running for Mayor of Atlanta, was criticized for making comments at a Republican Party Mayoral forum in Buckhead that he was “kind of bit a conspiracy theorist” regarding climate change. “I got a question mark on the global warming thing. I do believe in sustainability. I’m a science-minded person and I have a science background. But stuff is in the media too much … it’s hard for me to be convinced sometimes,” he said according to the Atlanta Journal-Constitution newspaper. Atlanta is now the largest city in the U.S. Southeast with a one hundred percent clean electricity goal, according to Environment Georgia. St. Petersburg, Florida, is the only other city in the Southeast with a similar goal. Twenty-five U.S. cities, including San Diego, California; Salt Lake City, Utah; and Chicago, Illinois have already adopted ambitious one hundred percent clean energy goals, the legislation states. Six U.S. cities, including Aspen, Colorado; Burlington, Vermont; Greensburg, Kansas; Kodiak Island, Alaska; and Rockport, Missouri have already hit their targets to generate one hundred percent of the energy used community-wide from clean, non-polluting and renewable sources. To be sure, the City of Atlanta is in a franchise agreement with Georgia Power; and as previously reported by APN, Georgia Power has been quite slow to add solar and wind energy to its total energy mix. Georgia Power continues to rely on dirty coal and the questionable boondoggle that is nuclear power at Plant Vogtle. Therefore, the City’s approach will likely have to involve a combination of incentives for customers to get more of their energy off of the Georgia Power grid, as well as partnerships with Georgia Power to develop a clean energy capacity that would offset Atlanta’s energy usage..
That is, with respect to the 2035 goal, the City, of course, does not have control over whether its residents and businesses continue to get their energy from Georgia Power, or pursue one of many clean energy solutions that the City might develop for Atlanta residents and business. Partnering with Georgia Power is key, Kiernan tells APN. “The City of Atlanta has a franchise agreement with Georgia Power that goes through the 2060’s, so no matter what, we’re stuck with them for the foreseeable future. There’s no divorcing Georgia Power,” Kiernan said. “We can’t control which electrons go in the City of Atlanta limit. I think we will have to make it so that Georgia Power is producing enough renewable energy at any moment of the day to cover what it being demanded in the City of Atlanta in 2035,” Kiernan said. “But we might need to figure out the arrangement that are enough green kilowatts being created at any given time – rather than every electron is a clean electron,” Kiernan said. Georgia Power did not immediately respond to a request for comment. APN spoke with a Georgia Power spokesperson a few hours before publication. Clean energy is defined in the legislation as energy derived from wind, solar, existing and low-impact hydroelectric, geothermal, biogas, and wave technology source. The legislation directs the Office of Sustainability to prioritize least expensive options such a weatherization, co-generation, district heating and cooling, decentralized electricity generation and smart grids/micro-grids, the use of industrial waste heat, building controls, automated lighting, solar-powered hot water heaters, and programs that create an energy-saving culture. It creates a strong equity framework for the plan, which will allow those who have the least to be able to benefit. UPDATE 1: Updated with interview with Colleen Kiernan, and with attempt to reach Georgia Power. Atlanta is a region in which wind energy is a loser, so solar would be the renewable electricity source for the city. It is ironic that May 5 has rained all day and the city would be without electricity if it depended on solar energy. The city also had a record cold temperature for the high of 56 degrees that broke the old record of 58 degrees in 1980. All this messing around with so-called clean energy is a waste of time and money. The argument carbon dioxide from burning fossil fuels is causing catastrophic global warming (climate change) is easily refuted by examining past temperature and carbon dioxide level data. For the past 100 years we have had temperature increases from 1910 to 1940, slight decreases from 1940 to 1975, increases from 1975 to 1998, approximate constant temperatures from 1998 to 2014, temperature increase from 2015-16, and falling temperatures in 2017. Changes in carbon dioxide are insignificant on global warming (climate change) compared to natural effects. If solar energy is forced on use by Atlanta, tax payers across the country will be supporting this program. Solar energy would not exist without mandates for its use and subsidies of 30 percent construction cost as a tax credit, forcing utilities to pay more than cost for excess electricity from solar panels. Because of solar energy’s erratic generation, utilities other means of generating electricity will be less efficient. Solar panels only last 25 years and solar systems created for Atlanta use will be toxic junk after 25 years. Solar energy has to cost more than Georgia Power’s electricity generation with coal, natural gas, and nuclear power. Atlanta taxpayers are the loser. We have a city with roads strewn with pot holes and no organized means of adaptive real-time traffic control. In addition, crime is all around us with car sliders, shop lifting, car break-ins, home invasions, and street muggings. Some means should be used to show young people work is more satisfying than being a gang member with no future. Atlanta deserves better government than those chasing unreliable, expensive renewable energy sources. What they propose is technically and economically unfeasible, even if electricity rates would triple. A 6kW solar system with battery storage to make one house independent of Georgia Power costs $18,000. Wonder how owners around Turner Field and English Avenue will afford that? Whether you believe in climate change or not – oil, gas and nuclear are dirty forms of energy – to the immediate environment and all human life …. (dirty water and land, earthquakes, radiation, black lung, etc.). We are killing the planet at an incredible rate. How can an educated person ignore the facts? The first thing Atlanta could do to help all around is put every teenager to work this summer, painting the roofs of buildings in the City. It did wonders for New York City. They saved tons of money in electricity costs, and gave the kids an opportunity to know what honest work felt like. The other way to help Atlanta work on the crime and homeless issues would be to mandate that the City does not spend a dime on landscaping, road beautification, etc. unless they use EDIBLE plants. The City does not seem to care much about the homeless, but they could at least make a stab at feeding the population they are kicking to the streets.